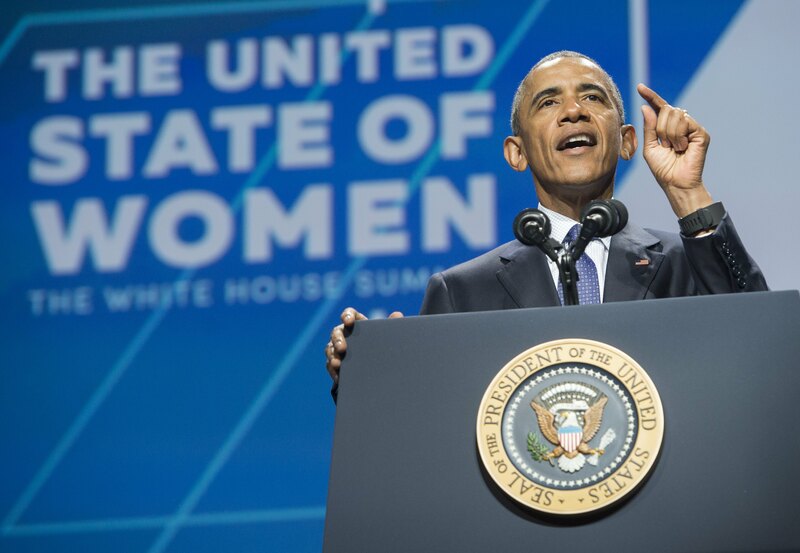 Speaking at the United State of Women Summit on Tuesday, President Obama declared himself a feminist and reminisced on his administration's legacy of supporting women. He also celebrated the allies that he sees making a difference for women in society. His address captured the president's usual, jovial spirit, but it sent an important message to leaders — government and beyond — about what it means to truly be a feminist. I may be a little grayer than I was eight years ago, but this is what a feminist looks like. Tuesday's event, which was organized by the White House, was the first of its kind — ever. The point of the day-long summit was to celebrate the progress that women have made and explore the priorities for moving forward. Obama certainly took care of the former, noting his administration's work in areas like paid family leave, women's healthcare, and, of course, representation on currency. Obama quipped about the Treasury Department's decision to feature a woman on the $20 bill. It's not just about the Benjamins. It's about the Tubmans, too. Obama may be a little grayer, but it's probably with good reason. He's been hard at work for the last seven and a half years — and much of that work has benefited women. It hasn't always been easy, though. He also noted in his speech that he's had to create progress for women even when Congress failed to do so. We don’t have to have Congress agree with us. We can go ahead and make progress without waiting for them. They’ll catch up eventually. In two such instances, Obama signed executive actions to help women receive equal pay for equal work. The first was an executive order to encourage pay transparency among employees of federal contractors. The order, signed in 2014, made it illegal for federal contractors to retaliate against workers who discuss their pay. At the same time, Obama instructed the secretary of labor to require federal contractors to submit pay data to the federal department of labor. Other times, Obama has been able to work with Congress on advancing women's causes. In fact, the very first piece of legislation that the president signed into law after taking office was the Lilly Ledbetter Fair Pay Act, which was intended to help women recover wages that were lost as a result of discrimination. Now, in one of his last moves as president, Obama brought women to the center of his administration's focus through the United State of Women Summit. Before passing the event off to the other speakers, Obama gave a nod to some of the women that lead the fight for gender equality, including his wife, First Lady Michelle Obama. The event's other speakers included such names as the first lady herself and Oprah.